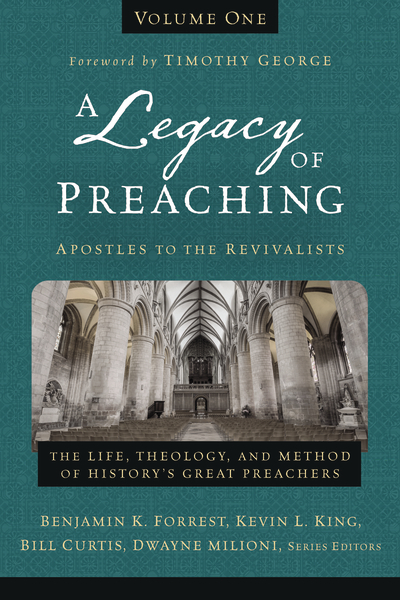 Covering a broad range of preaching over the centuries, the two-volume A Legacy of Preaching reference set is the definitive reference for experienced preachers who wish to deepen their own preaching as well as aspiring students who want to learn from the masters of the past. Volume One covers the period from the apostles to the revivalists and profiles thirty preachers including Paul, Origen of Alexandria, Augustine of Hippo, Francis of Assisi, Martin Luther, Jonathan Edwards, John Wesley, George Whitefield, and many more. Benjamin K. Forrest (Ed.D., Liberty University) is Professor of Christian Education and Associate Dean at Liberty University. He is co-author of Surviving and Thriving in Seminary (w/ H. D. Zacharias, Lexham, 2017), Good Arguments: Making Your Case in Writing and Public Speaking (w/ R. A. Holland, Baker Academic, 2017), and co-editor of Biblical Leadership: Theology for the Everyday Leader (w/ Chet Roden, Kregel, 2017). Kevin L. King (D.Min., Southern Baptist Theological Seminary; Ph.D., University of Pretoria) is Professor of Homiletics and Historical Theology at Liberty University. William J. Curtis (Ph.D., Southeastern Baptist Theological Seminary) is Associate Professor of Homiletics at Southeastern Baptist Theological Seminary. He is co-author of Engaging Exposition (B&H, w/ Akin and Rummage), and is senior pastor of Cornerstone Baptist Church in Darlington, South Carolina. Dwayne Milioni (Ph.D., Southeastern Baptist Theological Seminary) is Professor of Preaching and the director of the Ph.D. in Homiletics at Southeastern Baptist Theological Seminary. He is also the senior pastor of Open Door Church in Wake Forest, NC. Timothy George (PhD, Harvard University) is the founding dean of Beeson Divinity School of Samford University. An executive editor of Christianity Today, Dr. George has written more than twenty books and regularly contributes to scholarly journals.